1. The English Walnut has a thin shell. This nut is much esteemed and is an important article of commerce. It yields by expression a bland fixed oil, which, under the names of "walnut oil" and "nut oil," is much used by painters and is a common article of food. 2. The Peanut is also called Ground Nut and Earth Nut. It is cultivated in all warm regions of the globe, and its usefulness is such that it is likely to extend. 3. The Brazil Nut is a popular nutritious nut grown in Brazil. 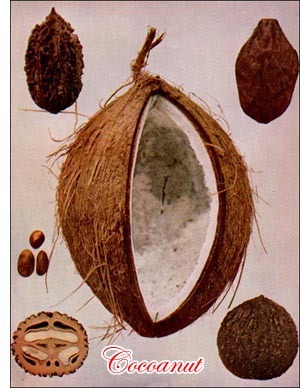 The large outer shell is filled with nuts, making a most peculiar fruit. The shell is very hard and contains a rich, oily meat in one piece like an almond. 4. The Hickory Nut abounds near the Great Lakes and in some parts of New Jersey and Pennsylvania. The nuts are in considerable demand and are sometimes exported. The shell is thin but hard and the kernel sweet. 5. The Filbert is the fruit of the hazel. The kernel has a mild, farinaceous, oily taste agreeable to the palate. In England filberts are usually large hazel nuts. The American hazel nuts are of two other species. 6. The Chestnut is eaten raw, boiled, or roasted, or is ground into meal, and puddings, cakes, and bread are made from it. The tree is common to Europe and America. 7. The Pecan, sometimes called the Illinois Nut, a species of hickory nut. The shell is thin and the meat well flavored. The tree grows in North America, chiefly in the Mississippi Valley, and in Texas, where it is one of the largest of forest trees. 8. The Almond grows on a tree about twenty or thirty feet high, a native of the East and of Africa, but has now become completely wild in the whole south of Europe.